There’s no question that the rise of connected devices has completely changed media consumption. However, according to Citi analyst Mark May, smartphones and other digital media devices may not be taking as much share from traditional TV as many think. The latest numbers from Nielson suggest media doesn’t seem to be a zero-sum game. 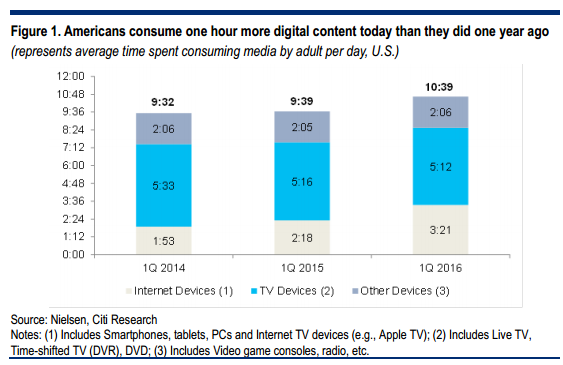 While it’s true that there is a limited amount of hours in the day for consumers, the total amount of time adults spend consuming media has been steadily rising in recent years. In fact, adults now view an entire hour more of media per day than they did just a year ago. Of course, growth in connected devices has been huge. In the past year, the amount of time adults spend on tablets is up 63 percent, the amount of time they spend on smartphones is up 60 percent and the amount they spend on multimedia devices (such as Alphabet Inc GOOGGOOGL’s Chromecast) is up 44 percent. Those numbers might imply that consumption of traditional TV is plummeting, but Nielson reports only a 1 percent decline in time spent on traditional media platforms in the past year. July 7, 2016 in Market News.